Everybody loves a rainy day, but not when that rainy day is game day. For the second home game of the year the crowd was noticeably smaller than a typical crowd due in large part to the nasty weather. 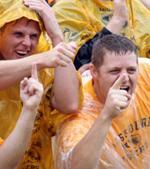 Despite the unpleasant skies, the Mizzou football team brought their A-game as they trounced Nevada 69-17. The rainy weather was not just a deterrent for fans, it also created some problems for both radio and equipment personnel. For the equipment staff the main issue was keeping everyone and everything dry. People on the sidelines needed jackets and more towels were needed to help keep the balls from getting too wet. Another issue that occurs during rain games is a problem with players wearing visors. Visors look cool and help protect your eyes; however, when the field is wet and it is raining the visors tend to fog up. There is no real way to avoid this problem besides taking the visor off, thus some players simply wipe their visor from the inside when it fogs up. Our radio booth, which sits on the top floor of the press box, does not have any windows making it open to the elements. This means that with any slight wind, water can easily blow into our booth and on top of our equipment. Water and laptops or microphones do not mix, so we covered the backs of our computers with trash bags and did our best to make sure the water did not ruin our equipment. The other problem the weather created was for our post game show, which is typically done outside. In order to avoid any problems we set up our equipment on the third level of the press box, free from the elements of mother nature, but further away from the players and the locker room. In order to get the players through the crowd and up to the press box we decided to use a golf cart which would not only be safer, but faster as well. The golf cart was a good idea; however, due to some miscommunication the golf cart we were suppose to use ended up across the street. Since I did not want to make the players walk, I found a golf cart no one was using and drove Ziggy Hood, our first interviewee, up the ramp myself. The problem was, while I was helping Ziggy get set up I missed an opportunity to grab Chase Coffman who I also wanted to put on the show. I was however able to grab another offensive weapon, Tommy Saunders, and convince him to come do the show with us. The show went smoothly as we dissected our defense with defensive line coach Craig Kuligowski. While Tommy was on the air he talked about the Mizzou football team as a family and spoke of how the off-season workout program really helped to make the program and the players better. After the players and coaches left we spent some time breaking down our next opponent, Buffalo, and discussed a little of the college football landscape including breaking down the week's big game, USC-Ohio State. Unlike last week when we did not leave the stadium until well into the night, we were done with our duties just a little before five on Saturday afternoon. As we rode down the elevator to enjoy the rest of our evening we congratulated each other on a job well done and shifted our focus to next week's game, the last non-conference tilt of the season.